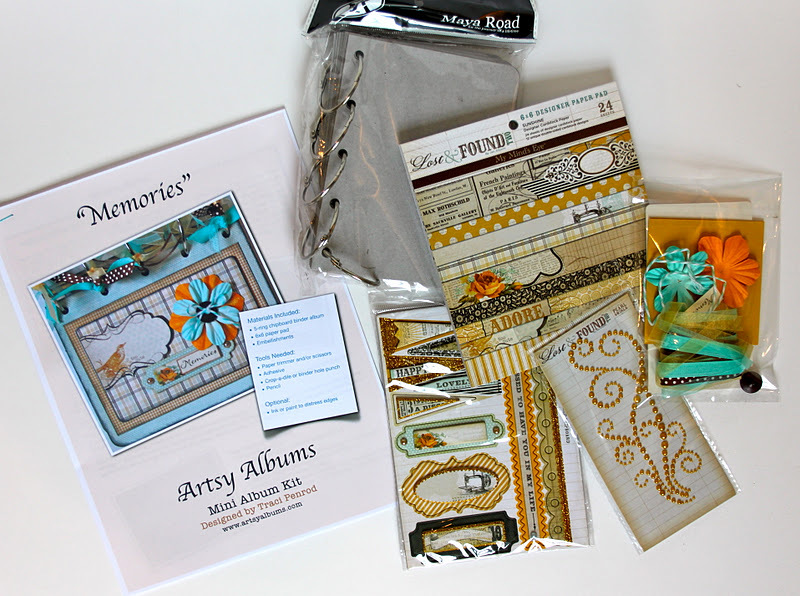 Artsy Albums Mini Album and Page Layout Kits and Custom Designed Scrapbooks by Traci Penrod: KITS are here!! Well at least one is....and more will be added this week. I had forgotten how long the instructions take to create :). The album was done in no time, but the instruction sheet (7 pages!) took some time. So here is the first of many Artsy Albums Kits. With this kit, you will be able to create an 18-page tabbed mini album using an adorable chipboard book from Maya Road, and the very popular My Mind's Eye line called Sunshine. All of the materials to make the album are included, in addition to full color page-by-page instructions. This little book would be perfect for photos of friends, family, mom, grandma, or yourself ! Create it for a gift or make it as a keepsake for yourself!